You’ve heard of Journey, no doubt. Maybe you weren’t fortunate enough to play thatgamecompany’s beloved exploration title because it was a PlayStation 3 exclusive, but you’ve surely heard of it. Journey is never going to come to the Xbox One, so you’ll never play it if your only gaming platform is made by Microsoft. But if you’re patient, then you just might be given the chance to play something similar to Journey, something created by one of the men behind the jewel of Sony’s last-gen indie library. Matt Nava previously served as the Art Director on thatgamecompany’s Journey. 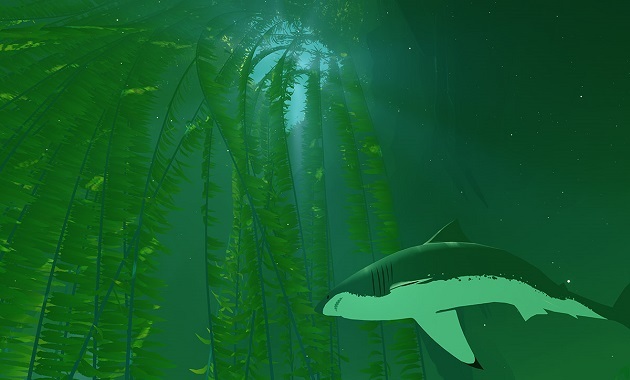 Now he’s working on Abzu, an underwater exploration game announced at E3 2014. Abzu has only been announced for PC and PlayStation 4 — so far. “Right now we’ve announced it’s going to be PC and PlayStation 4 at launch,” Nava said during a brief Q & A session with reporters and bloggers earlier this month at E3. He wasn’t getting off that easy, though. When pressed if that meant it was “exclusive” to those platforms or not, the Giant Squid Creative Director smirked and let out a slight chuckle. That blink-and-you-missed-it smile was likely over some combination of the frequency and tenacity at which he’s no doubt been asked that question, and the fact that he’s not allowed to answer it almost any other way. And yet, he tacked on a qualifier when answering the question. Abzu will launch exclusively on platforms that don’t have so much as a single x in their names, let alone two. Or a One. But after launch? Who knows? XBLA Fans certainly doesn’t, and Nava, if he himself even knows at this stage, isn’t telling. 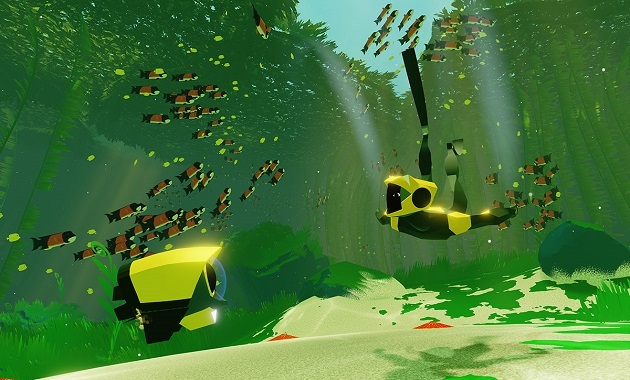 Not knowing whether it will eventually make its way to the Xbox One or not, XBLA Fans left Abzu off its best games of E3 list. Otherwise, it would have found its way onto the list. XBLA Fans Contributor Jill Randolph and I both played through the demo, and we both left itching to see what else lies beneath the waves in Giant Squid’s debut title. Abzu’s E3 demo began with the player taking control of a lone scuba diver on the surface of what was presumably the ocean. There was no boat or dock in site. 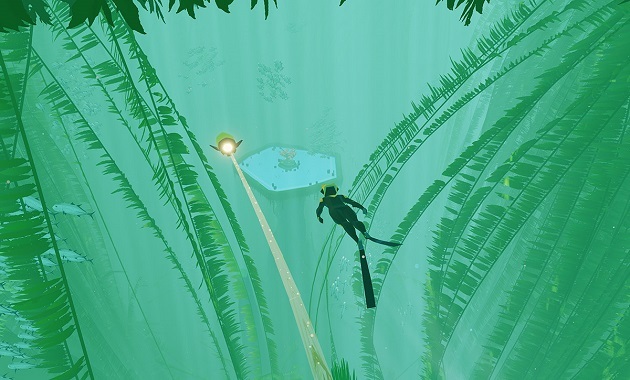 In fact, aside from some kelp, there didn’t seem to be anything at all of interest above water, which made it immediately clear that the game’s designers wanted players to dive below and start exploring the depths. As you’d expect, the crystal clear waters were populated with plenty of marine life. Schools of small fish swam about, and the diver could join one and sort of meander about as if just another fish in the sea. For a more direct path forward, the diver could hitch a ride. By grabbing hold of a giant sea turtle or an even larger stingray, she was able to speed through the water as if she was born to do so. All of these animals are true to real life, an element of realism Abzu will stick to throughout its duration. Individual sea creatures will remain in their pre-designated areas in the game, so it’s not possible to jump on the biggest, fastest animal you can find and motor your way through the entire game, which Nava said would be “slightly larger” than Journey. The handful or so of areas in the demo were separated from one another by underwater cliff walls that the diver could travel between by passing through short tunnels. The turtle and stingray mounts could be guided toward the tunnels, but they’d veer off in another direction once they reached them. But Abzu isn’t just concerned with where you’re going; it also lets players ask where they came from. If they want to, that is. When I play games, I tend to wear blinders. As an adult who works a nine to five in addition to reporting on the games industry, my free time for playing games is limited. If I’ve any hope at all of playing through most games to completion, I need to keep my eye on the prize: the main quest. Sure, I’ll dabble in sidequests here and there when they sound particularly interesting, but I tend to skip the majority of optional quests and have cut aimless wandering through games almost entirely out of my adult life. There just isn’t time for it. 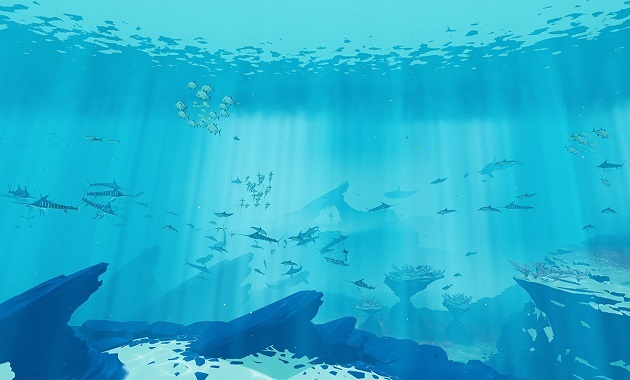 The path I took through Abzu demo compared to those taken by Nava and XBLA Fans’ Jill Randolph was testament to this approach to playing games. I went right for the fast-moving turtle and stingray and steered them toward the tunnels leading to the next areas. Jill and Nava showed me what I had missed by taking a straightforward approach. 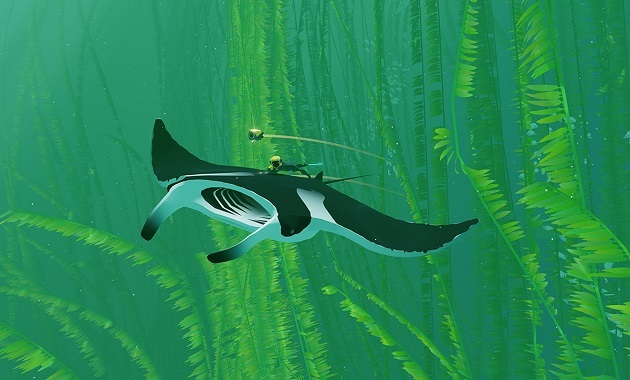 In Abzu, players can find little drones on the ocean floor, and those drones can be used to help you explore the environments. In this way you will discover bits and pieces that teach you about the mysteries of the world Giant Squid has created. Though his life was eventually cut short by a great white shark, I found one of the droids during my play session. Jill ended hers with three, and she used them to dig through a few spots on the ocean floor for clues. At one point she swam through an area full of vestiges of some unknown society. It bore a vague resemblance to Ariel’s treasure room in Disney’s The Little Mermaid, and a statue she moved past there looked a bit like a Chozo from Nintendo’s Metroid series. If you want to find out where such items came from, you’ll have to go looking for answers on your own; the game won’t just present you with the answers. That’s one way that Nava says his game will set itself apart from the last one he released. It’s important to him that developers don’t simply play on gamers’ nostalgia and retread ground already traveled. “I think the thing that I learned working at thatgamecompany, an amazing team of devs, is that devs can really provide a unique experience for players that is very new,” he said. 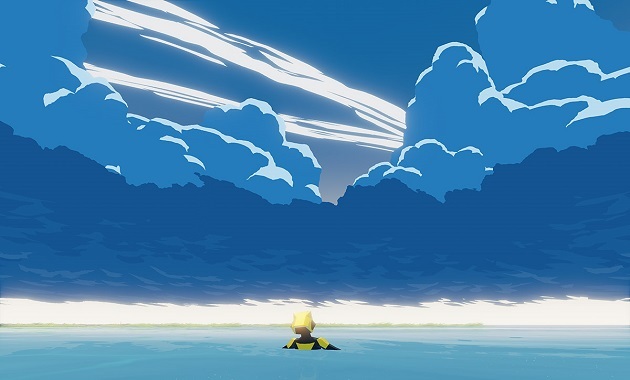 “And I think that’s something that I wanted to take further in Abzu, and really there are a lot of things in Abzu that are very different than the design of Journey. 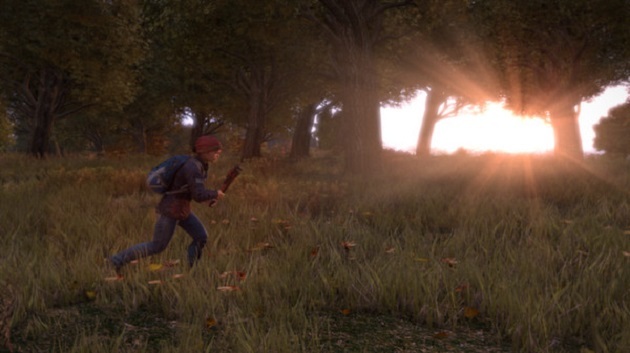 Whether E3 players chose to linger in areas and explore the unexplored or churn up some whitewater as they rode swiftly forward, the demo ended on the same note for them. Coming into a large area of open sea, they witnessed their drone letting out a sad whimper as it was scooped up into the gaping maw of the great white shark that Nava says will stalk players from start to finish. It was a shocking enough moment to make me jump. It was particularly alarming because it came at the conclusion of a demo that was otherwise content to let me leisurely swim through a calm ocean enlivened by procedurally generated fish, the type of wildlife that didn’t seem to care one way or another what I was doing. It doesn’t sound like players will be taking revenge against the shark, though. But curiosity, they say, killed the cat. Perhaps that’s relevant here, because Abzu’s diver looks like a cat thanks to the two pointy headlights fixed atop her helmet and her feline-like eyes. And they’re eyes that even a blinders-wearing gamer can’t help but want to see more through.